There’s a lot of misunderstandings and untruths about mobile homes and manufactured homes. In this article, we are covering the most frequently asked questions about mobile homes. Mobile homes aren’t perfect but they are a great housing choice for many families across the country. More families could have a chance at owning their own home and getting out of expensive housing if they would just look past the stigma attached to manufactured housing. That’s what we aim to do every day here on Mobile Home Living. With this article, we hope to put a few issues to rest once and for all. 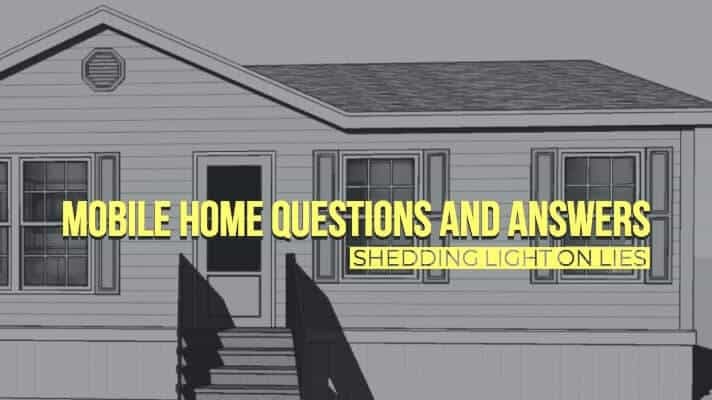 Unfortunately, people that have never been around manufactured homes don’t know the first thing about them and are often the main culprits to spread misinformation and mistruths. To put it bluntly, people that spread the mistruths about manufactured housing have never lived in one, or even been around one for that matter. It’s no secret that mobile homes have a few stereotypes and stigmas. A lot of people believe that everyone living in manufactured homes is poor and that our homes are made with 2×2’s. Neither is true. If we can get the truth out about mobile homes there will be less stigma. These mobile home questions and answers should help a bit. This is the most asked question we get so we’ve written an entire article dedicated answering it here. A mobile home was built before June 15, 1976. A manufactured home was built after this date. June 15/July 1, 1976 is the day when national HUD regulations took effect. This means all factory-built homes have to be built to a standard mandated by HUD. Most people do not care which term is used. The industry, however, goes absolutely mad if anyone uses the term mobile home when speaking of a home built after 1976. They wanted to shed its poor branding and start anew so they used the HUD law as a catalyst to do that (or try to, anyway). You can read more about the industry’s fight against the words mobile home in our article No, I Will Not Stop Using the Term Mobile Home – Get Over It. What are Labels, Titles, and Certificates? All transportable sections of manufactured homes built in the U.S. after June 15, 1976, must contain a certification label (commonly referred to as a HUD Tag) on the home. We’ve published an exhaustive guide to mobile home titles here. To learn more about mobile home HUD tags, VIN, labels, serial numbers, certificates, and data plates click here. 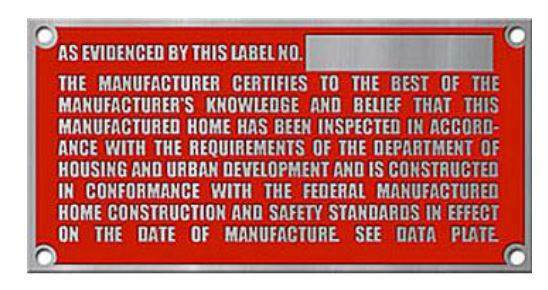 The red metal plates you see on the back end of a manufactured home is a manufacturer’s certification that the home was built in accordance with HUD’s Manufactured Home Construction and Safety Standards (commonly referred to as the code or the standards). The Standards cover Body and Frame Requirements, Thermal Protection, Plumbing, Electrical, Fire Safety, and other aspects of the home. The Standards are published in the Code of Federal Regulations under 24 CFR Part 3280. A manufactured home data plate. How can I find the make, model or manufacturer of my home? If your home was made after June 15, 1976, there should be a compliance certificate (HUD Data Plate) in the home. It can be on the inside of a cabinet door, under the sink, around the breaker box, etc. There should also be a red plaque on the exterior of the home that will give you the basic information such as the manufacturer and the model year. There may also be a manufacturers plaque around the end or front door of your home. This will be the case for some homes made before 1976, too. It’s more a form of advertising but it will give you enough information to get you started. A serial number stamped on a manufactured home chassis. You can also look on the tongue or frame of the home for a stamped number. This is the homes serial number. It is just like a vehicle’s VIN number and can identify the model and manufacturer. You may be able to get a rough idea of the year of the home by looking inside the toilet tank (assuming it’s the toilet that came installed in the home). The fact we feel it necessary to add this to our mobile home questions and answers section blows my mind but it’s a misconception that is alive and well. Unfortunately, meteorologists are a top source of this stupidity. These are highly educated people that went to college to study weather patterns! There are Youtube videos of several meteorologists saying that a mobile home park is pulling a tornado toward a town. They may be joking but it isn’t funny. Storms, wind, rain, and snow are not attracted to any certain type of home. A tornado’s deadly force does not selectively discriminate between the site-built and manufactured home or “mobile homes” (those built prior to the HUD Code’s implementation in 1976). Mother nature hates us all equally and without prejudice. Can Manufactured Homes Withstand Hurricane Winds? In areas prone to hurricane-force winds (known as Wind Zones II and III, according to HUD’s new Basic Wind Zone Map) the wind safety standards require that manufactured homes be resistant to winds up to 100 miles-per-hour in Wind Zone II, and 110 miles-per-hour in Wind Zone III. This zone map shows wind zone, roof load zones, and thermal zones. In both of these zones, the standard for manufactured homes is now more stringent than the current regional and national building codes for site-built homes located in these wind zones. This PDF released by FEMA about Understanding and Improving Performance of New Manufactured Homes During High-Wind Events is helpful for anyone wanting to know more on the subject. An important element in the adequate wind safety of a manufactured home is the proper installation and anchoring of the home according to the manufacturer’s instructions. Installation standards are regulated on a state-by-state basis. When properly installed and anchored, the manufactured home’s wind resistance is significantly improved. For each new manufactured home sold, the manufacturer must include installation instructions to properly support and anchor the home. This requirement is part of the windstorm protection provisions of the HUD Code. There is no meteorological or scientific basis to think that manufactured homes attract tornadoes. The reality is one of coincidence: most manufactured homes are located in rural and suburban locations, where meteorological conditions favor the creation of tornadoes. A tornado’s deadly force does not selectively discriminate between the site-built and manufactured home or “mobile home” (those built prior to the HUD Code’s implementation in 1976). It is estimated that approximately 40 percent of all tornadoes have winds in excess of 112 miles-per-hour. A direct hit from a tornado will bring about severe damage or destruction of any home in its path. If a manufactured home has a below-ground basement, the home’s residents should seek shelter there. If a home, site-built or manufactured, does not have a below-ground basement, the residents should seek immediate below-ground or another appropriate shelter from the storm’s possible effects. During a tornado warning, a tornado has been detected. Residents should seek shelter in an interior room with no windows. Can manufactured homes gain value or appreciate? This is one of our most frequently asked questions about mobile homes of all. Manufactured home can and do appreciate. Of course, there’s a lot of variables that play into that appreciation. In October 2018 Market Watch published an article titled Mobile-home values might rise as fast as regular homes—here’s why that matters. If your manufactured home is permanently installed on owned land the combined property can appreciate. If your home is on a rented or leased lot it will rarely appreciate. The average rate of depreciation is 2.7% -3.6%. 97 of those homes increased in value by an average of $2,985. While it was close, more homes appreciated by over two thousand dollars than not. For even further analysis and information you should read our article, Manufactured Homes Can and Do Appreciate. Are mobile and manufactured homes more prone to fire? No. The reason you think that is because the newspapers and TV stations don’t know how to feature any positive stories regarding mobile homes and journalist can be lazy and biased. Four stick built homes and a mobile home could catch fire tonight and they would only report the mobile home fire. How many positive news stories regarding mobile homes have you seen? On a serious note, Foremost Insurance did a national fire study and found that site-built homes were more than 2 times as likely to experience a fire than manufactured homes. They found that 17 site built homes out of 1000 had home fires as opposed to only 8 per 1000 manufactured homes. Mobile homes weren’t very energy efficient at all. Modern manufactured homes are just as energy efficient as a site-built home. In 1994 there was a new federal law initiated to make all homes more energy efficient and the regulations have continued to be updated. 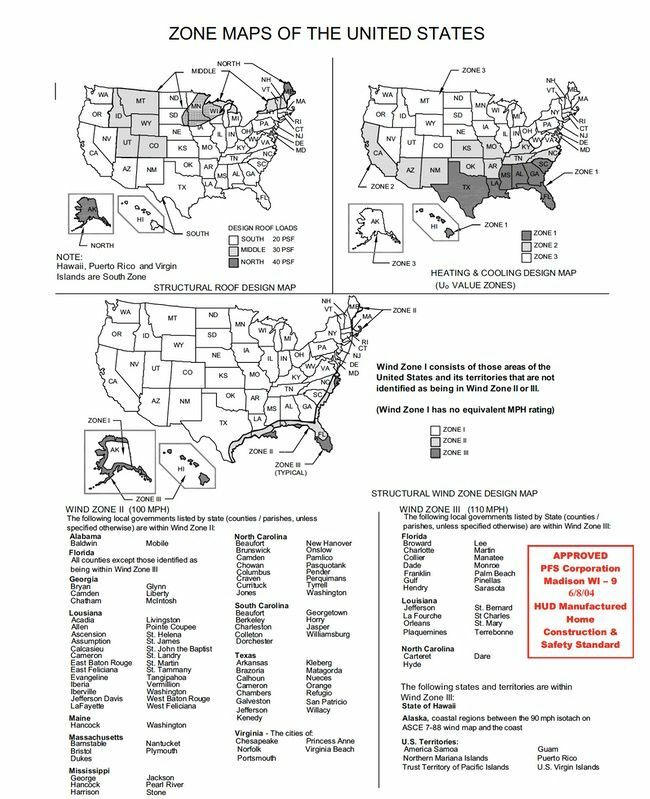 HUD went so far as to divide the country into 3 regions and manufactured homes produced for each region have to meet the performance zones and snow loads for each (see the zone map above). 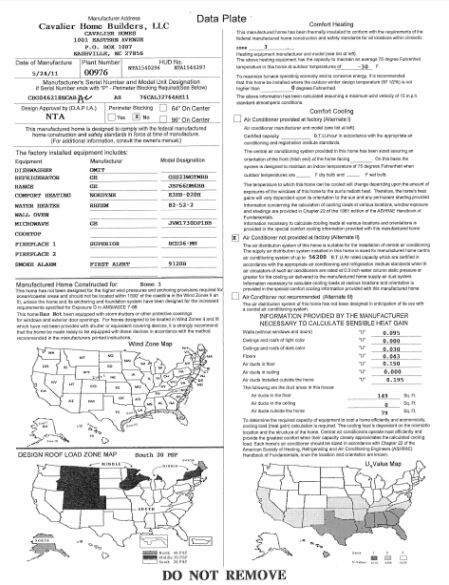 Here’s what NMHOA says about it: A new thermal zone map for manufactured housing identifies three regions: the southeastern states are grouped from South Carolina to Texas in Zone I; the mid-zone of the nation is grouped from North Carolina across to California in Zone II, and the remaining northern part of the country is grouped together in Zone III. HUD’s new standards require that manufactured homes comply with one of three alternative options: design the home’s overall thermal efficiency to account for heat loss through the insulated surfaces of the thermal envelope (better known as Uo-values) for three zones; adjust Uo values with credits for high efficiency heating and cooling equipment; or by totally redesigning the home with new innovative technologies that use no more energy than published Uo values. Zone II, including Oklahoma, requires an Uo of 0.096. These efforts are ensuring that manufactured homes remain affordable, not only in start-up costs but for the life of the home. While this isn’t technically a frequently asked question about mobile homes it is an issue that needs to be covered. Many complaints from manufactured homeowners are about the quality of their homes. They talk about the staples and glue or the flimsy insulation or the smaller framing. Modern manufactured homes are available in different build qualities and prices. The more affordable models are the most popular because they offer a beautiful energy efficient and environmentally friendly home at a great price. However, a $19,999 single wide is not going to be built like a site-built home. It will have staples and glue and smaller framing because it’s a more affordable method of home construction. You absolutely get what you pay for in manufactured housing. That’s the beauty of them! Have another Frequently Asked Questions about Mobile Homes? Comment below and we’ll do our best to get you the information you need. As always, thanks for reading Mobile Home Living®!